Some of the best gifts are those that are personalized or custom. This Valentine's Day, don't just buy a gift, create one. CafePress can help you to create custom Hoodies, T-shirts, Paul Frank SIGG Water Bottles, iPhone Cases, iPad Cases, Underwear, Thermoses and more. They are also always adding new products like their new Stadium Blankets and Custom Yoga Mats. I was lucky enough to receive a dark custom zip hoodie. The picture (yes, you can use pictures too!) is from when I saw them live in California last September. 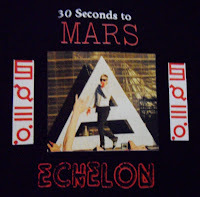 Then, I placed the bands name, the word "Echelon" (a term for dedicated 30 Seconds to Mars fans), and some of the symbols that represent the band. I was a little worried about the photo because it wasn't the best quality (I had zoomed in to get this picture). CafePress did a wonderful job! The photo looks just like it does on the computer screen (if not better) and the entire design came out perfect. It is also well done. These letters/ photos will not be rubbing off anytime soon. As for the hoodie itself, it felt a little stiff where the design was when I first received it. I couldn't wait to try it on, so I wore it anyhow. I was really impressed with how soft and comfy it is. The slight stiffness worked itself out after a few wears and I didn't even notice it when the hoodie was on. It does run really big, so I recommend ordering a size smaller than normal. I ordered a size smaller than what I normally get and it was still a little big (which I personally love). 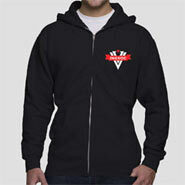 The hoodie is 90% preshrunk cotton and 10% polyester. They even have whole sections devoted to "I Love My Husband" or "I Love My Girlfriend". 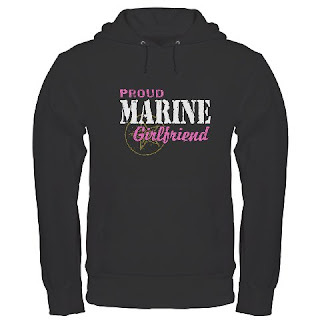 I think the military one's are particularly sweet since the Wife/Girlfriend can stay warm and think of her soldier while he is away. 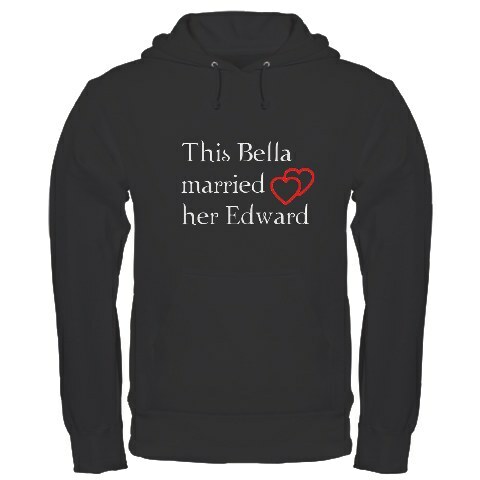 I definitely recommend CafePress for hoodies or any photo product you may want. I have received several products from them and they have all been fantastic. Tell me about one of your favorite Valentine's Day gifts. Please leave a separate comment for each extra entry (if it says 3 entries, leave 3 comments). If you do not leave separate comments, it will count as only 1 entry. Make sure you leave your e-mail address, or have one visible in your google profile. Giveaway ends 02/02/10 at 9pm EST. Giveaway is for US residents only. You must be 18 years old. No P.O. Boxes. Winner will be chosen randomly. Winner will be contacted via e-mail and then will have 48 hours to respond before a new winner will be chosen. Disclaimer: I received the above product(s) for hosting this giveaway. I was compensated in no other way. The opinions stated here are my own honest thoughts. Love this giveaway :) I would get it customized. My favorites Valentine's gift? Honestly, a nice dinner out with my husband and maybe a movie is what I love. Simple. With kids, we don;t get out much. I like the angle wings, or something along those lines. If I won I would get the customized in memory of my twin boys that passed away and wear it to our Walk to Remember. My favorite Valentine's Gift is a weekend trip away. I'd like to have the John Muir Quote shirt from Cafe Press. A fabulous dinner at a French restaurant in Vegas. My favorite Valentine's Day Gift was Kerby Lane Pancakes. We ate there for our first Valentine's day back in college and they now sell their mixes! Sad to say I have never gotten a Valentine's gift from anyone other than my Dad or my kids. My fav was the year my dad bought me my own heart-shaped box of chocolates when I was 8. I felt so grown up. My favorite Valentine's Gift (now that we have kids) is just a day of peace and quiet!! That is basically my standby-by gift. I'll take it anytime I can get it!! I am big into the reusable bottles and I just love the Recycle Turtle design. If I could win, I would get an expecting from INdia shirt because we are adopting from INdia. I also liked you on facebook and cafe press. my favorite valentines day that my husband and I had as a couple. It was great I remember it raining and we didn't have a car yet so out he went walking in the rain to get me some flowers. I thought it was so romantic. I didn't ask him to go or anything, he just got up and walked out the door and said he would be right back. 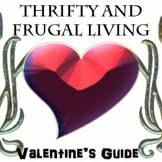 My husband once surprised me on valentines day with a candle lite steak dinner when I had to work late. Despite knowing that I don't celebrate V-day, my dad used to always send me candy and/or a small plush when I was a teen, which I still appreciated. My favorite gift was this big (probably about 3ft. long) Panda plush holding a heart. I like the I'd rather be reading tee very cute. I like the alone time! My hubby and I are music lovers, so we usually get each other a new cd or music dvd. my boyfriend gives me flowers, he brings em to work, i love that! I hate to sound cliche, but my fave V-day gift has got to be candy and flowers. Although the occasional piece of jewelry is awesome! Lol. Wow, i didn't know they made birth announcements now! I would love to get a few of my son, who i had 2 weeks ago. Better late than never lol. I really like the Simple Flourish Boy style. My all-time favorite Valentine's gifts was a beautiful bracelet my husband brought me back from his tour in Iraq. I'd love to have a Paul frank bottle form cafe Press. My fave Valentine gift is simply a small box of chocolates and a nice card. My favorite Valentine Day gift was when my husband woke up early and cleaned the snow off my car so I could go in to the office. It was on the weekend and he hates to wake up early. One of my favorites was my guy driving back home when I didn't think he'd be able to and I got a surprise visit. One of my favorite and most memorable Valentine's Day gifts is when my guy proposed to me! He didn't want to do it on Valentine's Day because he thought it was so cliche, but he did it at the end of the weekend (we had gone on our first out of town trip). It was raining and he knelt in a puddle but it was worth it. My favorite Valentine gift was a set of heart shape ruby earrings, necklace and bracelet that my husband gave to me the first year that we were dating. I am a fan of Cafe Press via Facebook as Jill Myrick.